I have to share a kind of embarrassing fact with you guys: I am a terrible omelet-maker (and crepe-maker, for that matter.) I would love to be able to make omelets well because I like to eat them, but mine end up very ugly and falling-apart-y and often runny on the inside. And when I say “often,” I mean “pretty much always,” and that, unfortunately, does not help with my complicated egg aversion. So my answer to all my omelet problems are frittatas. They sound fancy and hard, but really, they’re way easier than omelets and come together in just a few minutes. 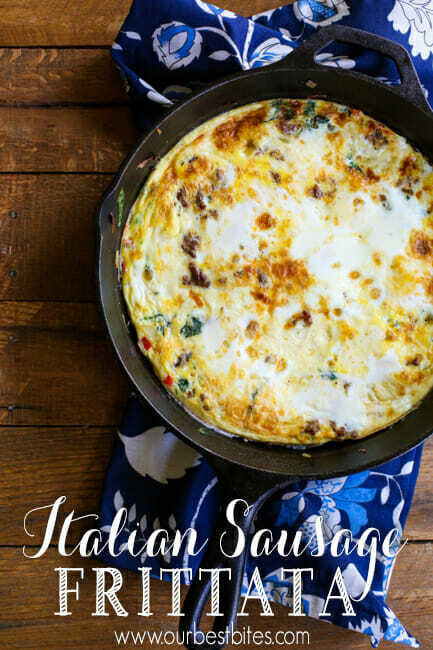 In this month’s issue of Cooking Light, they have a whole spread on various frittata options, but really, you can do it yourself–the egg/milk/seasoning mixture is the same, and the cooking method is the same, but you can swap out the meat and veggies for whatever you prefer, just like an omelet. Ham, chicken, asparagus, gruyere, mozzarella, cheddar, pepper jack, tomatoes, mushrooms, asparagus, fresh herbs…whatever strikes your fancy, throw it in there! One of the great things about frittatas is that the leftovers hold up beautifully, so when you’re starving in the morning and trying to get your kids up and dressed and actually, like, moving instead of staring at a wall or something, you can grab a few bites here and there. When your two-year-old is eating crackers, string cheese, and frozen peas for lunch and you’re about to begrudgingly pick into the same thing, frittata to the rescue. When it’s dinnertime and the last thing in the world you want to do is make dinner? Frittata. It’s good cold, it’s good hot. It’s like the Stanley Tucci of the culinary world. The first time I made this, I made it as written and then I left it under the broiler a little too long and it burned, which ended up being a good thing because there were things I definitely wanted to change when I made it again. I upped the salt, I threw in some green onions and garlic, I used grape tomatoes that I cooked until they were just about to burst, and I doubled the cheese because, you know, cheese. Even still, the calorie count is very modest (213 calories if you cut it into 6 pieces, which was plenty for the adults in our family). For this frittata, you’re going to need 6 eggs, 2 egg whites, milk, salt, pepper or Tabasco sauce (I have a thing about black pepper in my eggs. Can’t do it. 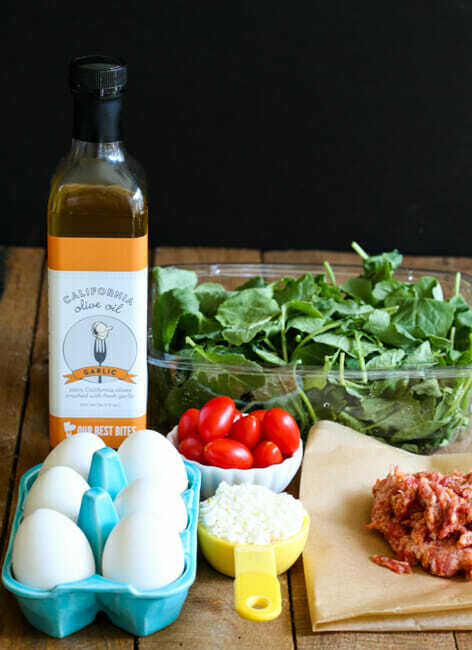 ), Italian sausage, extra-virgin olive oil (I used OBB’s Extra-Virgin Garlic Olive Oil), baby kale (more about that in a minute), green onions, garlic, red bell pepper or whole grape tomatoes, and feta cheese. Crack the eggs and egg whites into a small mixing bowl. Add the milk, salt, and Tabasco sauce and whisk to combine. In a 9″ oven-safe skillet (a cast iron skillet is perfect), cook the sausage. Remove from pan and drain on a paper towel. Anyway. Kale. I actually like kale in recipes like this because it holds up better than spinach. But eating it uncooked? I feel like it’s 1986 and I’m at a Sizzler and I accidentally ate a garnish. Add the kale, green onions, and garlic and cook, stirring frequently, until the kale is wilted. Add the pepper or tomatoes and cook for a few additional minutes, until the pepper starts to become tender or the tomatoes are ready to burst. Turn the oven broiler to high. Sprinkle the cooked sausage evenly over the veggies. Sprinkle the feta over the sausage, then carefully pour the egg mixture evenly over everything else. Cook for 5-6 minutes over medium heat, completely leaving the pan alone. Place the pan in the heated oven for 2-3 minutes or until the frittata is setting up and starting to just turn brown in a few spots on top (with the broiler, you’ll go from almost done to burned in just a few seconds, so don’t go anywhere.) You may need to turn the pan if some spots are getting too done while others aren’t quite done enough. When done, remove the pan from the oven and allow to stand for 5-10 minutes before cutting. Serves 4-6. Whisk together the eggs, egg whites, milk, salt, and Tabasco sauce. Set aside. Return the pan to heat and heat the olive oil over medium heat. Add the kale, green onions, and garlic and cook, stirring frequently, until the kale is wilted. Add the pepper or tomatoes and cook for a few additional minutes, until the pepper starts to become tender or the tomatoes are ready to burst. I love frittatas for the exact reason you said, they are delicious the first time but make a wonderful warm up meal…..and I need meals that make great leftovers, especially when it’s breakfast time and I’m sick of making scrambled eggs again. That is my favorite Studio C clip! And like you, I hate black pepper on eggs and my omelettes always look awful. Can’t wait to try this! I’m with you in the kale department. I like it cooked, but I feel like eating it raw is oddly similar to what it would be like to eat lawn clippings. I stopped counting the times when I wanted to make an omelet and ended up with scrambled eggs instead, arghhh! This looks fabulous thought, so delicious! I prefer spinach over kale but will give it a try with this. Thanks for the recipe Kate! Thanks for the recipe! I’ve been wanting to try my hand at a frittata since I had a delicious one at a cute little cafe while I was on vacation. I’ll definitely usee your recipe as a starting point, but think I’ll be switching up the filling. The one I had on vacation used giardiniera, which seems like a great shortcut, plus it adds zip. I never thought I’d like raw kale until I tried it in a recipe that calls for chiffonading (is that a word?) it and then massaging the dressing into it. I later learned that massaging kale is a real thing. (I think Lynn Rosetto Kasper might have mentioned it on her show?) Anway, I once brought the kale salad to work to share and skipped the massage. Big mistake. It did indeed taste like weeds. I’m not sure whether anyone should bother TRYING to like kale, but if you have the inclination, massaging it is the answer! I’ve heard of massaging kale, too, I’ve just never tried it! Maybe someday soon, when I get really brave, haha! Oh my gosh I’m the same with omelets! I try to flip them and they won’t flip, so I wait a little longer then try to flip them again and they’re brown on the bottom! I always get a layer barely cooked on the bottom and then stick them under the broiler until the top isn’t “snotty” anymore. I cannot tolerate snotty or browned eggs. Sounds great! We’ll definitely try this one. My kids love that Studio C sketch. Never made a fritatta frittata fritata…okay, spell check didn’t like any of those. Like a quiche without the crust? Or is the texture more dry? I should just make it and find out cause that sounds yum. Thanks for the studio C clip. It made my day. They are SO funny! Sometimes. Gotta give them A for effort the rest of the time though. It’s like a quiche without the crust. And yes, we love Studio C around here–it’s something our whole family enjoys, which is hard to find! I don’t have a cast iron skillet. Could I make it in a non-stick skillet and then transfer the frittata to a deep-dish or regular pie pan? Well, when you pop it in the oven, it will still be runny in places, so it might not transfer well. Do you have a stainless steel skillet, or a non-stick that can go in the oven? I made this for dinner in an oven-safe non-stick skillet and my family ate so much of it I only got a tiny little slice. And might I say perhaps you haven’t found the right kale yet?? Don’t give up on it yet! I planted 8 types last year and found my two favs- one is a soft and tender one perfect for salads, the other grows massive leaves great for ” wraps” yum. Looooove kale! But I have to say, If I was basing my lake experience on the sub standard stuff from the grocery store, I wouldn’t like it either…. Except for the shredded stuff in those awesome costco packaged salads! Yum! 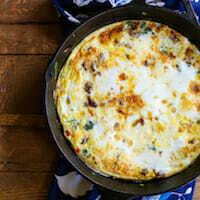 I love making fritattas for my family and I use my non-stick skillet, it works great. I add leftover pasta, veggies (zucchinis lately), rice, or lunch meat, with any kind of cheese I have on hand. I have also added cottage cheese or Greek yogurt to boost the protein content. I love egg dishes totally. I love sausage too. I just made a sausage and egg deep dish quiche just so I would have some lunch food to take and warm up. You are so right. Good version of this dish too. Okay, the 1986 Sizzler comment just made my day. HA!!!! Any suggestions on cheese other than feta? I don’t think my kids would be down with that. These sound worth trying. I love omelets when other people make them. But generally hate them when I try to. But these might just work. purple onions instead of green, and Colby cheese instead of feta. Here goes…..It turned out very well! I know that quiche freezes very well, so I would think that this would too, but has anyone tried it? Tips for freezing &reheating?